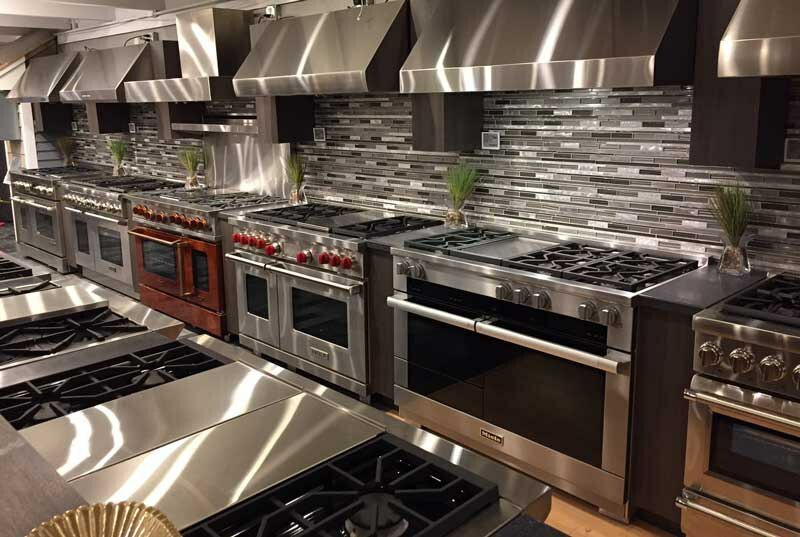 BlueStar and Miele are on the opposite sides of the spectrum for ranges. Other than size, these ranges have absolutely nothing in common. Miele is about functional technology with every type of cooking available. BlueStar on the other hand is about power with the ability to customize the range to your personal tastes. We will look at both ranges, but first, more about the Miele and BlueStar companies. Miele is a German company and has been around since 1889. They are the largest family owned appliance company in the world. Miele builds their appliances to have a 20 year life expectancy through quality controlled manufacturing and a superior attention to detail. They produce not just the products but many of the components instead of outsourcing to other vendors. They are new to the pro range market since 2014-2015. 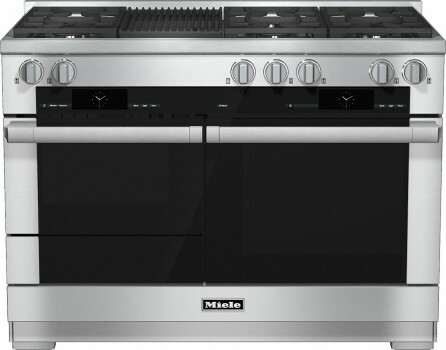 Miele has three different cooktop configurations, which are ordered model specific. 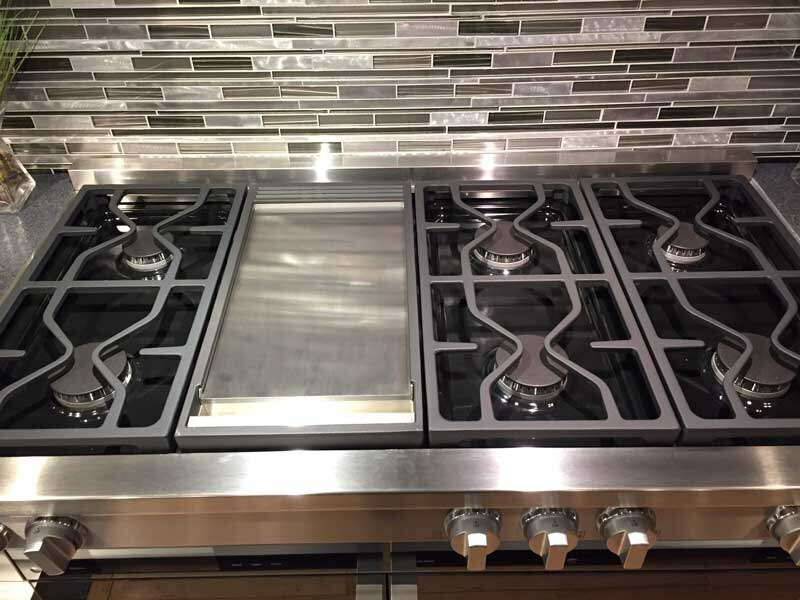 You can get an eight burner cook top for $12,499.00 or six burners with either a griddle or grill for $12,999.00. These models are all outfitted with a main convection oven, speed oven and also a warming drawer. What separates Miele from all other brands is the technology. You touch a button for the food type and the range computes time and temperature. Miele also features steam assist, so you can bake bread or harden cheese on lasagnas or other foods. Instead of a side oven, the range is equipped with a speed oven for microwave, convection or both. Under the speed oven, there is a warming drawer to keep food warm for up to three hours without dehydration. 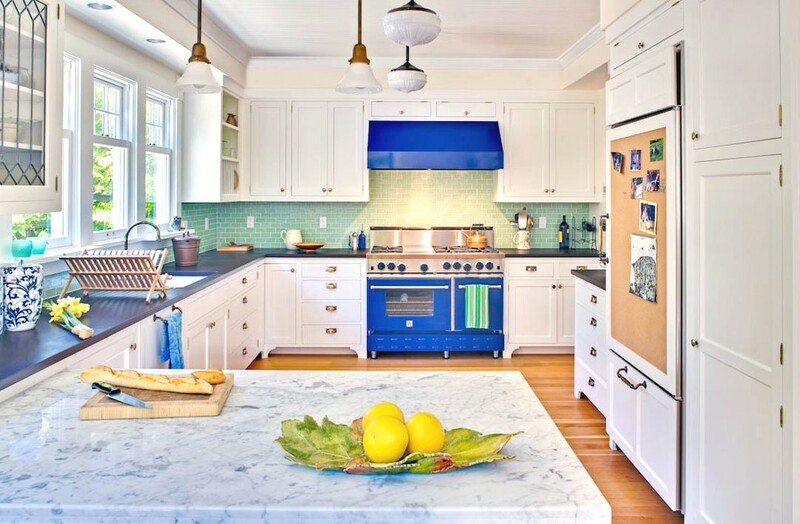 BlueStar was launched in 2002 by the Prizer-Painter Stove Works Company who has its roots in Reading, Pennsylvania. They date back all the way to 1880 with the manufacturing of such products as hot water heaters, residential and commercial ranges. BlueStar ranges were built to emulate commercial style ranges but used in a residential kitchen. They are still a family owned company. BlueStar has three different series within their brand, Heritage, RNB and Platinum. 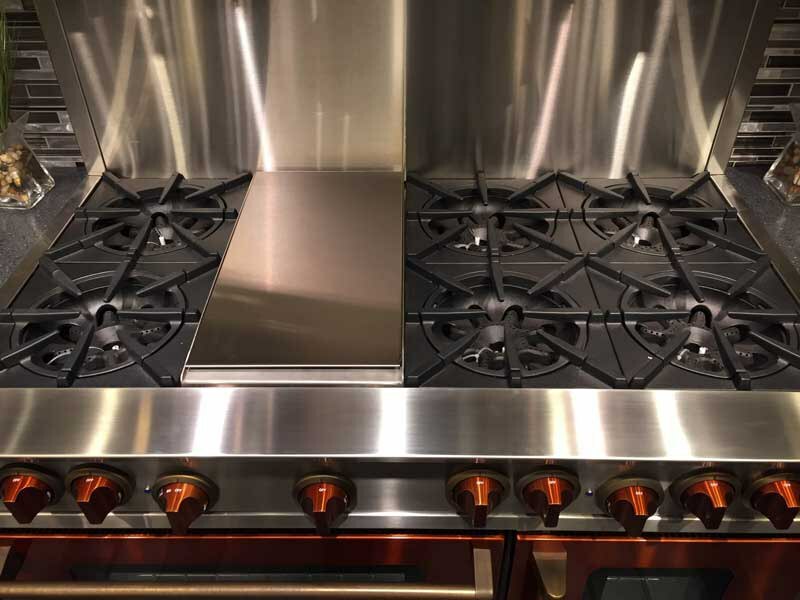 Their ranges are only available in all gas, either natural or liquid propane, and come with a ton of flexibility on the cooktop. The 48 inch Platinum is priced at $11,126.99. BlueStar is customizable from color, trim and even the opening of the door. You also have unbelievable output at 25,000 BTU at the top end from open burners. Ok, there is much to compare. They are so different. BlueStar is more powerful on the top with up to 25,000 BTU. It is an open burner system (more oxygen, more flame) versus sealed for Miele. Sealed burners are easier to clean, because spills stay on the top. However, you can disassemble the open burners to clean at the sink for heavy baked on spills. Miele has the integrated infrared grill and/or grill. BlueStar has the portable griddle/charbroiler. Miele should work better, because it is thermostatically controlled. However, BlueStar is much hotter, so the difference will not be that much. We have Miele live. We need to hook up the BlueStar. The oven performance should be similar in temperature, yet different in performance. BlueStar is the only European gas convection, meaning it is blown in from the back for even temperatures. Miele has the twin electric convection. Gas is a more moist heat and is better for roasts and meats. Electric is drier and better for baking cookies and cakes. Miele has the superior technology. You hit a button and cook your food. There is no guesswork. You have a speed oven instead of a regular oven as well as the food warmer, so you can cook differently. BlueStar does not have a clock or timer. It is a true commercial type range. You can customize BlueStar in literally thousands of ways with 750 colors, different trims and knob details. The doors can be a side-swing door or a fold down door. It is limitless. So it is technology against power and customization, which is better for you? Want to learn more about Kitchen Appliances? Get our Pro Cooking Buying Guide with features, specs, BTU outputs of every pro range as well as detailed profiles of every brand. Well over 185,000 people have read a Yale Guide.